Truffles, Truffles – Who wants a Truffle? Who wouldn’t want a truffle? I know I always want truffles! Luckily I can go in to the kitchen and make some rather than order some online or drive out to the store to buy them. Years ago, I would have never thought that I would be able to make homemade truffles. I would get my truffle fix through the Godiva chocolate store and pay an arm and a leg, just for one truffle. But I have managed to surprise myself and now I can make truffles at home for half of the cost of buying them at a store. And it is so much more rewarding. My favorite kinds to make are cookie dough truffles and coconut truffles. 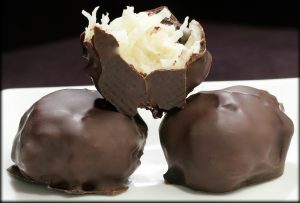 In my first posting, I shared the coconut truffle recipe and I am going to include it again in this post. I have been told by several coconut lovers that the truffles are better than Mounds or Almond Joy bars, and non-coconut lovers who try them even go back for seconds. 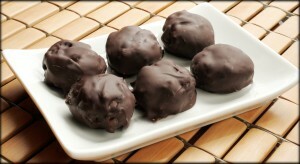 I will also share a recipe for cookie dough truffles, which are the first truffles I learned how to make. They are so amazingly good and totally addicting. The best part is that they taste exactly like cookie dough covered in chocolate (it doesn’t get any better than that), but there is no raw egg in the cookie dough mixture, so no worries about salmonella. It all sticks together using sweetened condensed milk, and that also plays a big role in making them so delicious. I think it is only fair for me to add this warning to the truffles posting, so here it is: Once you learn how to make either of these truffles and they are shared with your friends, they will always ask you to make them! Any time you are invited to a potluck, baby shower, wedding shower or other food-centered event – you will be going with truffles in hand. DIRECTIONS: Place the butter and brown sugar into a large mixing bowl. Using a hand mixer set on medium-low speed, cream the butter and sugar together until smooth. Add the condensed milk, flour and vanilla extract to the mixture, mix to incorporate well. Fold in the chocolate chips. Cover the bowl and place in the fridge for a few hours. Once chilled, use a cookie scoop to roll the cookie dough batter in to 1.5-inch balls. Place each ball in a container lined with aluminum foil. Cover each container with foil, and place in the freezer for 2 hours. Put squares of baking chocolate in to a small saucepan. Place a double boiler filled one-quarter full with water over medium-high heat. Once it begins to steam through the holes of the boiler, place the pan of chocolate on top. Stir the chocolate until it is fully melted. Take one container of frozen cookie dough balls out of the freezer. Remove chocolate from heat. Using a spoon, drop in one or two of the cookie dough balls at a time in to the melted chocolate. Fully coat with chocolate, then drop on to a baking pan lined with a silicone baking mat or wax paper. Repeat steps with the rest of the frozen cookie dough balls. Once all are coated and on the baking pan, place the pan in to the refrigerator to allow chocolate to harden more. They should be ready to indulge in within 30 minutes or less after putting in fridge. Try to eat just one, I dare you! DIRECTIONS: Place the coconut, condensed milk, almond extract, vanilla extract and flour in a large mixing bowl. Mix together until well incorporated. Cover the bowl and put in to the fridge for 2 hours. Line a few containers with parchment paper. Once the mixture is chilled, use a cookie scoop and roll 1 to 1.5-inch balls and place each one on the prepared container. If using the almonds, press one almond in the middle of a coconut ball so it sticks (the ball may flatten, but that is OK). Cover the containers with foil and place in the freezer for 1.5 hours. Place chopped chocolate in to a small saucepan. Place a double boiler filled one-quarter full with water over the stovetop on medium-high. When water simmers and steam is coming up through the boiler, put the chocolate on top of the double boiler. Let the chocolate melt completely, and frequently stir until it is melted. Take one container of the coconut balls out of the freezer. Remove melted chocolate from heat. Use a spoon to drop one or two coconut balls in to the chocolate. Coat entirely with the chocolate, and then place on a baking pan lined with a silicone baking mat or wax paper. Continue until each one is coated, and repeat with remaining containers in freezer. Once all are coated, place the baking sheet in the fridge to cool and allow chocolate to harden. Will be ready to devour within 30 minutes or less. ENJOY! It is always best to use a high quality of chocolate for dipping truffles, but our pocketbooks don’t always allow for that. I recommend using the Baker’s Brand of semisweet or bittersweet baking chocolate bars for truffles. They are available in the baking section at almost all grocery stores, and they run about $3 to $4 per 8 ounce package. If you choose to use milk chocolate for the coating, I recommend the Ghiradelli brand of baking chocolate. It is sold at most grocery stores in 4 ounce bars and runs about $3.50 to $4 a bar. Don’t be tempted to use candy melts or chocolate chips for dipping the truffles. These have less butterfat and a different melting property than the baking bars, so they do not produce as great of results. Happy dipping! ← What does beer go good with?